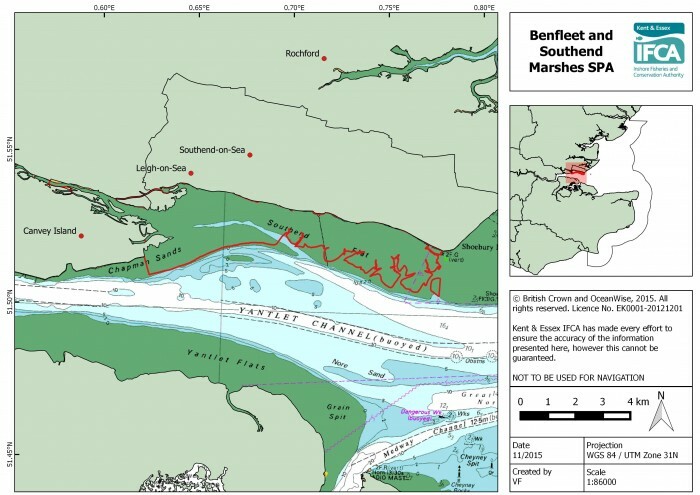 Benfleet and Southend Marshes SPA is located on the north shore of the outer Thames Estuary, and covers an area of 22.51 km2. The site comprises extensive areas of saltmarshes, cockle shell banks, mud-flats, and grassland. These productive habitats in turn provide a wide range of feeding and roosting opportunities for internationally important numbers of wintering wildfowl and waders. Over winter, the area regularly supports 34,789 individual waterfowl (5 year peak mean 1991/2 – 1995/6) including: Dunlin, Ringed Plover, Oystercatcher, Knot, Grey Plover and Dark-bellied Brent Goose (JNCC, 2015). Some commercial trawling and netting occurs within the site. Harvesting of bait and shellfish occurs from the shore. There is a commercial port and a small harbour at Leigh-on-Sea. KEIFCA is responsible for assessing the effects of commercial fishing within this site and must implement appropriate conservation measures to avoid damage to EMS by fisheries activities.